Bobby Valentine Expects To Be Back Next Year. Ben Cherington Is Already Thinking About His Next Manager Search. The Red Sox Are Fantastic. We thought we ought to check in with the Red Sox, just a year removed from being the Best Team Ever. (Seriously, will this cover ever get old?) Yesterday was the season's final game at Fenway, and to celebrate the Sox held a ceremony honoring their All-Fenway Team. 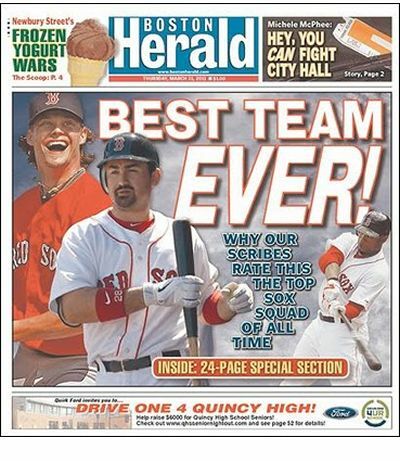 It was a pretty unapologetic attempt to bring in fans with reminders of the glory days (a "transparent eighth anniversary of their World Series win," one bitter scribe put it, as about half the two dozen players on hand were on that 2004 team), and it failed even at that. The ballpark was anywhere from one-third to one-half full, and fans in the outfield were being upgraded to seats directly behind home plate. The Red Sox, naturally, announced a sellout crowd of 37,247. The drama was not on the field, as Boston scratched out four hits en route to loss No. 87. Instead it was the semi-Parthian shots in the yearlong battle between Bobby Valentine and pretty much everyone he works with. 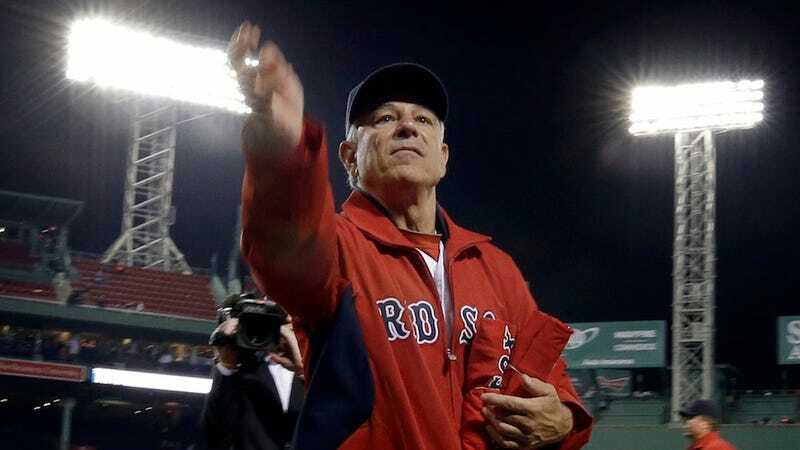 Reporters asked Valentine if he thought this would be his last game managing in Boston, and he said, presumably smirking, "No, there hasn't been any dialogue. I mean, we've talked, but not about that. Which makes me think I'm coming back." "And if this is my last day, I'd like to thank you all, or at least most of you, for your professionalism this year and your willingness to put up with all the stuff that goes on on a day-to-day basis and wish you all great health to you and your families. Enjoy." "But I think that what we know we need to do is hit the ground running in this offseason. One of the things, as I look back at last offseason, that didn't go perfectly was simply the amount of time that we spent on the manager search and what that did to the rest of the offseason. I would like to spend less time on it this offseason, that's for sure." So, Valentine says he'll be back. Cherington says probably not. Only one of these two guys actually gets to make that decision, and it's not the one who's alienated his players, fans, and bosses.